*This article first appeared at News@Fairfield on September 12th, 2013. 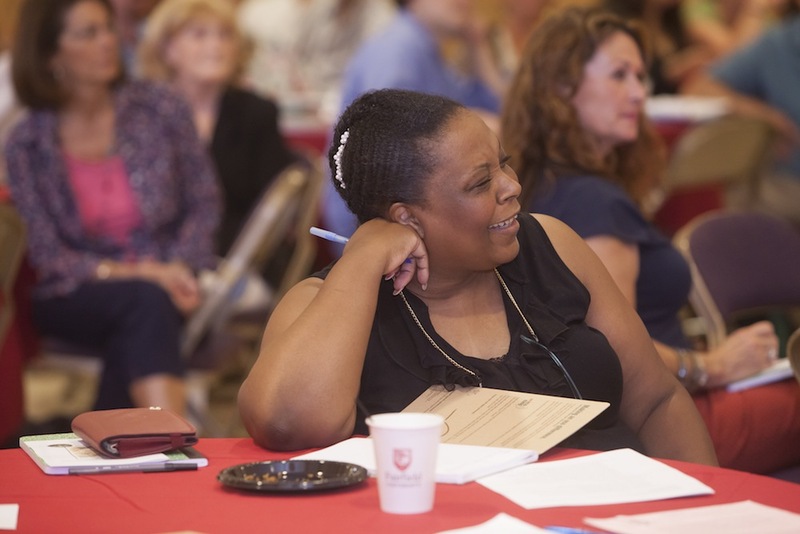 For the 65 Bassick High School teachers who gathered in Fairfield University’s Oak Room in late August, it was all about literacy—teaching their students to write, to read, and to communicate clearly, effectively, and reflectively. The morning began with a light breakfast and greetings by University President Jeffrey von Arx, S.J., who told the assemblage that the National Writing Project’s “teachers teaching teachers model is deserving of recognition” and stressed that the University is committed to its ongoing relationship with Bridgeport City Schools. The daylong, end-of-summer professional development event was organized by GSEAP’s Dr. Bryan Ripley Crandall and made possible through a federal SEED grant awarded to the Connecticut Writing Project-Fairfield in support of improving and promoting interdisciplinary literacy practices associated with Common Core State standards. The 10 breakout sessions for the back-to-school kickoff included methods of supporting literacy for English language learners, presented by Dr. Anne Campbell, and differentiating learning for students with disabilities, presented by Dr. Hyun Uk Kim. An interdisciplinary planning workshop with Dr. Patricia Calderwood and another on helping students make personal connections within their writing, offered by memoirist Sonya Huber, were also popular. “The mission for the last year has been to build literacy leadership across all content areas at their school, and they wanted to start the new school year right,” explained Dr. Crandall.